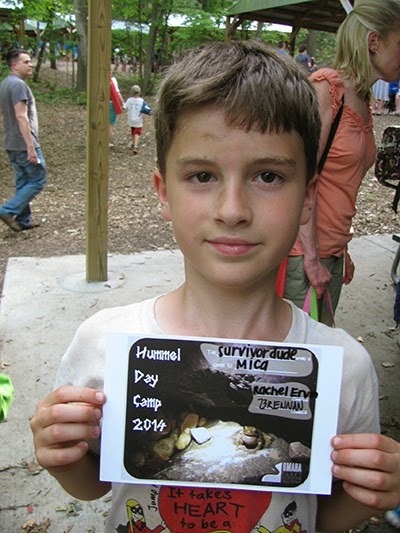 If you remember before I went on vacation Mica went to Hummel Day Camp. I posted about it here and here. BTW his rash only lasted about 4 days. That makes me wonder if it wasn't bug bites. Anyhow he's good. I gave him probiotics to help get him back to normal. When I read about chiggers AKA red bugs they kind of matched what he had as well. The only thing you can do to avoid them is to stay away from that particular spot, or wash you skin hard with soap and water. He has the same camp coming up next week, so we'll see if he looks all rashy or bug bity then. He always takes a bath after camp, but he's at camp all day long. It's kind of hard to avoid them all together. The Friday at the end of the camp they had a family night. They sing their songs, and do a skit. Then the kids are awarded for something. Last year Mica was awarded the Robin Hood Award. He was pretty into archery that year. This year Mica was awarded as the Survivor Dude Award. I guess he came to camp talking about Indiana Jones every day. They thought that award was a the most fitting. I'll be interested to see what award he gets next week. If you were a camp councilor what award would you make up? That is so cute the "Survivor Dude Award". He is having a great time. I give my kids Probiotics too, I think it is important and I believe it helps the immune system. Oh, I love the survivor dude award! That's a fun one! Hahaha - well Indiana Jones IS pretty cool! That is an awesome award. That's awesome that they make the award unique to the camper! What a fun award. I bet Mica is proud of that one.